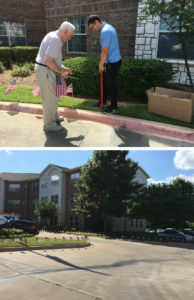 WWII veteran JC Reneau supervises maintenance crew in the posting of a flag border across the front of our campus. We are so proud of all of the fine men and women who live here who have served our nation through three wars. They and their spouses are the source of our country’s strength. Thank you for your service!